The first priority of the new Board was to expedite the conversion of Melbournes large cable tram system to electric traction. But before this commenced, there was a lengthy planning process which resulted in the preparation of the 1923 General Scheme, which was submitted in February 1923 for approval by the Minister of Public Works. Once this was achieved, construction of new electric lines moved ahead , and the Boards Holden Street Workshops produced the first two W class trams. This opened a period of rapid expansion of the M&MTB tram fleet throughout the 1920s to cover the traffic requirements of the converted cable lines and the new electric lines. One line that did not proceed was a single-track line along Bell Street between the Coburg and Preston lines, proposed in 1922 for the purpose of car transfer between these two systems. Instead, this was to be superseded by the construction of the Holden Street line three years later. However, the cable tram system needed more capital in order to meet the demands of increasing patronage. This required the construction of additional cable tram dummies and trailers, as well as upgrading of several of the engine houses to supply more power for the more frequent services and speed up the cable. 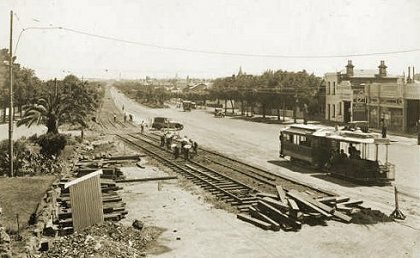 Looking north on St Kilda Road near St Kilda Junction in 1925, with track being prepared for conversion to electric traction. A general downturn in the economy during 1927 and 1928 caused the Board to defer conversion work during 1928. This would prove to be an early warning of the impending Great Depression. This downturn was also noted by the Parliamentary Committee on Public Accounts, which recommended to State Parliament that the M&MTB be relieved of the payments to Consolidated Revenue. However, the government of the day conveniently ignored this recommendation. In the meantime, the Board was taking action to minimise the cost of operating its cable trams. It installed fuel saving devices in the engine houses, and contracted out the job of planing out corrugations in the rails to extend rail life. The closure of the Esplanade line saw its relatively unworn rails used to replace much of the rails on the Richmond line. Surplus boilers and engines from closed engine houses were recycled to other engine houses in order to extend their life. The conversion of the Melbourne suburban rail system from steam to electric traction between 1918 and 1923 cut into tramway patronage, due to the improved service frequency and cleanliness of the red rattlers. But this was not the only source of competition for the M&MTB. During the twenties, private motor vehicle numbers in Melbourne increased by close to 30% annually, not only drawing away clientele but also creating the now-common phenomenon of the traffic jam. 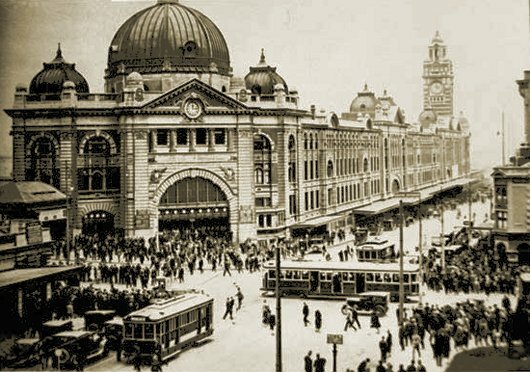 Flinders Street Station with W, Q and M class trams, late 1920s. Photograph courtesy Public Record Office Victoria. Major maritime strikes in 1920 and 1921 resulted in significant periods of restriction of tramway operation, due to the lack of coal for electricity generation and cable engine house operation. This reduced the Boards revenue, as did the lingering effects of the worldwide influenza epidemic. The rise of independent and unregulated motor omnibus services also saw passengers shift from the tramways. However, these services were unpopular not only with the M&MTB, but also with local municipalities, as the heavy buses carved up the road surfaces, requiring the local councils to increase their road maintenance expenditure. for buses operating outside this zone, an annual tax of £2/5/0 per seat for solid tyre vehicles and £1/5/0 per seat for pneumatic tyre vehicles was applied. The higher rate for solid tyre buses was due to the greater damage they inflicted on road surfaces. The money raised by the seat tax was distributed to municipalities on the basis of the number of bus miles run in each municipality. However, the imposition of this tax led to the financial collapse and liquidation of most private bus lines within weeks of the legislation coming into force, removing a major source of competition for the Boards services. The M&MTB purchased its own fleet of motor omnibuses in 1925, primarily to provide a service during the disruption of cable tramline conversion to electric traction, but it also opened its first regular route between Elsternwick Railway Station and the Public Library (now the State Library of Victoria) in Swanston Street, which ran until August 1926. Other routes were opened later to Williamstown and Balwyn Road from the Central Business District (CBD). A major issue for the M&MTB was the cost of electric tramcar maintenance. At the beginning of the decade, tramcars were averaging 6400 km between services. As a result of a desire to improve tramcar maintenance standards, and to cater for the construction of new electric tramcars for the conversion of cable tram routes, the M&MTB established the Preston Workshops, spending capital amounting to £326,300 on its development over the decade, and employing over 500 tradesmen. The result of this was an improved mileage of 32,000 km between services. As part of the construction, double track tramlines were installed on each of the above bridges, although trams never ran across the last of these three bridges. The expansion of the electric tram fleet required additional depot space. The decade saw the expansion of Essendon, Coburg and Malvern Depots as well as the construction of new depots at Glenhuntly (1924), South Melbourne (1925) and Camberwell (1930). Rail from the closed Puckle Street line in Moonee Ponds was used in the shed roads of South Melbourne Depot. All this construction activity resulted in both massive capital expenditure and depreciation, as the cable system was converted and written off, and electric lines extended and improved, particularly between 1919 and 1926. This effort was to lay the foundation of the Melbourne tramway system for the rest of the twentieth century. The construction of the Holden Street and Victoria Street lines was significant, as these lines allowed the isolated former FNPTT and NMETL lines to be connected to the main system  the two major parts of which (Northern & Eastern Divisions) were connected by the conversion of the Swanston Street cable tram line in 1926.